Among our recent subscribers are Roger K. Pabian, Peter Preston-Morley, Heath MacAlpine and D. B. Bennett. Welcome aboard! We now have 1,241 subscribers. Many thanks to Paul Petch who clued us in on a possible source of the formatting problems we're been having. A programmer at Binhost.com is looking into it. Paul, Gar Travis, Pete Smith, Jim Duncan, Bruce Perdue and others helped review some test mailings. We still have some work to do, but hopefully we're getting closer to a resolution. Thanks for your patience. This week we open with news on this week's NBS activities at the American Numismatic Association convention in Los Angeles, CA. Next up are reviews of numismatic books new and old on topics including Isaac Newton, counterfeiting, U.K tokens and Olympic medals and coins. Also, Tim Shuck provides a review of the new PCGS CoinFacts.com web site. In news of interest to researchers, Google has greatly increased its newspaper index. Other topics this week include archival storage boxes, Guttag Brothers tokens and a project to catalog the work of medallist Marcel Jovine. To learn about the collection of rare, one-of-a-kind books, read on. Have a great week, everyone! As my last official act, I introduced the newly elected slate of NBS officers. Incoming president Dan Hamelberg then took nominations for three additional new directors: Adams, Martin Logies and Syd Martin, who were elected by acclaim. A tour around the room introduced 25 members present plus news on new books and new auctions, of which there will be many. The meeting concluded with an auction run by the master of impudence, Brad Karoleff. The master raised $15,000 and left (most of) them laughing. Whether Sir Isaac Newton's battle with the criminal underworld is "unknown" may be putative. The general public may not be aware of it, just as they are unaware of anything beyond his having "discovered gravity." Numismatists may be more familiar with his tenure as warden and master of the British Royal Mint. Newton's prosecutions against counterfeiters have been a footnote to that, summarized in two works by Sir John Craig: "Isaac Newton and the Counterfeiters," (Notes and Records of the Royal Society (18), London: 1963); and Newton at the Mint. (Cambridge: University Press, 1946). This new book fills in the story nicely. 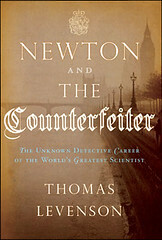 Newton and the Counterfeiter: The Unknown Detective Career of the World's Greatest Scientist by Thomas Levenson (Boston; New York: Houghton Mifflin Harcourt, 2009) is a masterwork narrative. Levenson teaches science journalism at MIT. He was granted a Peabody Award and an Emmy for his PBS Nova documentaries. Search the Barnes & Noble website, media.barnesandnoble.com, and you will find that he is as comfortable in front of a camera as behind one. Our editor, Wayne Homren, asked how this book compares to the works of Sir John Craig. 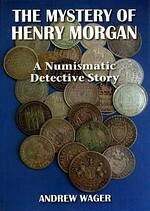 For the numismatist, few, if any, new details come from this book. The story is what it is. Historical documents only reveal so much. We cannot apply our loupes to William Chaloner's counterfeit coins and banknotes. Levenson quarried the original documents, and then smelted, leached and refined them for public consumption. This book takes you to the streets of London at the turn of the 17th and 18th centuries, into the Mint, and down the alleys. Levenson creates powerful word images, scintillating with four-letter words properly engaged. You can smell London. Detailed notes support the narrative, but they are not marked in the text. I kept the Notes bookmarked while I read. The Bibliography runs over 150 citations, including, of course, the works of Sir John Craig. 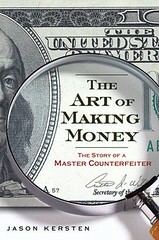 This is the story of a master counterfeiter, Art Williams. But the book is largely about the psychological wounds inflicted by an irresponsible father who abandoned his young children and the elder son's escape from a Chicago public housing project. An admirer of his mother saved Art from life as a gang member by teaching him how to counterfeit paper money and how to distribute it with minimum risk. Had Art followed his mentor's rules, all might have been well, but he didn't, and suffered the inevitable consequences. After his release in 1999 from a three-year prison term in Texas for burglary, Art was encouraged by a girlfriend to go straight. But he was depressed by the low wages he earned as a construction worker and by the strain of contributing to the support of a son from a previous relationship. When he saw a "New Note" hundred dollar bill of the series of 1996, he succumbed to the challenge of successfully counterfeiting it and of defeating the pens used to detect counterfeits by producing marks on the notes that change color. The numismatic content of the book consists of the means used by Art Williams to circumvent safety features of the "New Note": the watermark, the security strip, and the color-shifting ink of the denomination mark on the lower right side of the obverse. The security strip and the watermark were handled cleverly by producing sandwiches in which fake security strips and simulated watermarks were inserted between two layers of paper that were then glued together. Microprinting and colored fibers in the paper were reproduced by the ink-jet printers Williams used to print the portions of the design that are intaglio printed on real notes. Williams never used intaglio, and indeed used conventional printing only for the treasury seals and serial numbers that he applied with an offset press. When author Jason Kersten was interviewed in June on NPR about the man he called "the world's greatest counterfeiter", a BEP engraver phoned in to ask whether Art Williams did intaglio work. Kersten's assurance that Williams did no engraving, undermined the forger's reputation. Williams has been busted three times in the past decade because he was careless in allowing family members to pass his fakes and passed them himself. The heavy dose of popular psychology, blaming most of Art's flaws on his father's desertion, overshadows this book's meager numismatic interest. Jason Kersten, Gotham Books, New York, 2009, 292 pp hardbound, no illustrations. For anyone familiar with the early 19th century British silver shilling and sixpence tokens the name Henry Morgan will be equally familiar. Some tokens bear his initials, some his name and some his name and street address - the notorious 12 Rathbone Place. But who he was has always been a mystery. Andrew Wager is an active numismatic researcher specializing in tokens of the U.K. His book is doubly interesting for numismatic researchers because in addition to describing what he learned about Morgan and his tokens in his research, Wager details his research step-by-step, taking the reader along for the ride on a difficult, interesting and rewarding journey. As noted in other E-Sylum book reviews (such as Fred Holabird's Coins of the Comstock, it is a painstaking task under ordinary conditions to compile information about long-ago token issuers from historical records such as city directories, municipal records, newspapers and the like. But Wager's task was complicated by the common name of his subject. There are thousands of Morgans and dozens of Henrys to be found in the records, and sorting them out two centuries later is no simple task. This, coupled with the fact that "Henry Morgan" is also the name of a famous pirate led earlier researchers to speculate that the name was the nom de plume hiding the true identity of the token maker. The first seven chapters detail Wager's review of the earlier published research on Morgan, and his independent searches through historical archives in search of the true Henry Morgan. Pictured in the book are several of Morgan's tokens, Photos of buildings at the addresses where Morgan lived or conducted business, and original source documents including parish register marriage and birth records, an 1808 letter to Boulton and Watt, and an 1843 almanack advertising a venereal disease cure (yes, there is a connection!). Much of Wager's research focuses on the family of Frederick Dietrichsen, a London tailor who operated businesses at the address listed on Morgan's newspaper advertisements, 12 Rathbone Place. I think the book would benefit from the addition of a family tree diagram to make it easier to follow who's who. A reader who takes in the book at one sitting may not require it, but as one who had to read it in multiple sittings having a diagram would have been helpful. Wager's review of insurance company records luckily led to a clue. However, without an index the task was going to be a lengthy one, and I was davised by the librarian, with a certain lack of confidence in her voice, that "I might be lucky". After a long trip to the Guildhall Library in London and two hours into a laborious trawl through the original registers I was beginning to think my quest was a waste of time. Then, serendipity! While what Wager learned from the records was important, but not conclusive. Another clue came in the form of a letter from Mr. Morgan himself. It came from a perhaps not-so-surprising source for modern researchers - eBay! Chapter nine illustrates and discusses the implications of the previously unknown August 1811 printed form letter. I won't spoil the fun by revealing the author's conclusion. I certainly recommend the book to collectors of U.K. tokens and to numismatic researchers in general, of which there are many in the E-Sylum readership ranks. Wager rightly notes that there are many tools available to researchers today that were unavailable to authors of the past. We have to remember that nowadays it is much easier to make the kind of connections that I have been able to in researching this book. The most important of these was identifying the name of Frederick's wife, Sarah, and I was able to do this thanks to the work of the Church of Latter Day Saints in creating the International Genealogical Index and placing it on the Internet. William Boyne, William Davis and Captain Warren, the three main nineteenth century cataloguers of the series did not have the benefits of such modern technology. Below are links to two earlier E-Sylum articles about the book. In the second, author Andrew Wager offers a discount for E-Sylum readers. A new catalog arrived today from Monaco for my library. It is Olympic Medals and Coins, 510 B.C. - 1994, by Victor Gadoury. It was published in 1996 by Victor Gadoury Publications with ISBN 2-906602-11-6. Victor was an old friend from our meetings at numismatic shows in Germany when he was in the Canadian Air Force and I was in the U.S. Army. He was discharged in Germany and opened a numismatic business in the beautiful town of Baden-Baden in Bavaria. In later years, my wife loved visiting that town! His ethnic background was French and dreamed of living in France but he ended up in Monaco. I think that was a better choice! He was into coins, notes and tokens and then started a publishing arm in his business. His catalogs are beautiful!! He could not write all of the catalogs so he co-authored some and had other authors completely write them. He unexpectedly passed away in 1994 at a fairly young age. I miss our regular correspondence about the French colonial pieces of the Indochina area! This latest addition to my library was just by chance when I noticed it in a book list and contacted Genevieve Brunet in Victor's old firm. Her email is G.Brunet@Gadoury.com. Genevieve replied and told me it had a very few Southeast Asia pieces. This was enough for me so I ordered it and it arrived today. I quickly discovered it was being written by Victor when he passed away and Romolo Vescovi finished it. The catalog starts off with some history of the games and then into coins minted in Olympia. I am not sure but these are not necessarily Olympic coins but some do exist for those conducted in ancient times and they are not in this catalog. 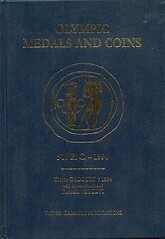 Before modern coins were minted commemorating the Olympics, the catalog describes and illustrates only the medals, badges, plaques, etc., of the games. Then it gets into coins and it appears there are a lot of them, but the great majority from my region of Southeast Asia are missing. I wrote to Genevive and told her the next edition's author(s) can contact me for them. For some of my friends interested in wartime Olympic pieces, there are a very few medals minted during WWI, and of course, the Berlin Olympics of 1936. One of my surprises was that Tokyo was selected for the 1940 Olympics, then it was cancelled because of their war with China. But there is one medal for it from Tokyo, and one medal from Finland, and a small Finnish badge too! The 1944 Olympics were to be in London but they were cancelled and held there in 1948. But there are 50th Anniversary medals issued for 1944! The Korean War did not cancel the 1952 Olympics in Helsinki so there are many pieces for it. Depending on your dates for the Vietnam War, there were at least two Olympics. In recent times, it appears war is not a big enough concern to cancel them. If you are into the Olympics, I am sure you will want this catalog in your library. If you are into very nicely hardbound catalogs, it and many other Victor Gadoury published catalogs should also be in your library. Thanks for the great review, Howard. Readers note: a book doesn't have to be brand-spanking new or even in print to warrant a review. Tell us about one of your favorite books! Here are some comments on the new PCGS CoinFacts web site. There is an 'Introductory Offer' price of $95.40 for one year, a bit less expensive than the monthly rate. I don't know if this will be a standard annual rate or if it truly is a short-term offer. I subscribed at the annual rate. There is a lot of information on the new site, though accessing all of it requires the user to pay attention to the embedded links on each page. Using the 'Mercury' dime as an example, the link on the Home page takes you to a page with general information and obverse/ reverse photos of the type. Also here are three additional tabs, Date Only; Date and Mint Mark; and Date, MM, and Major Variety. Each tab displays a list of year dates of the type (or dates, mintmarks, and varieties, depending on which tab is clicked- Date and Mint Mark appears to be the default). The listed dates are also links; click on one of these and a new page opens, presenting brief historical data, related coins and varieties, rarity and survival tables, additional links to the PCGS price information and population reports (the same format as before), condition census information, and public auction information: lots of good stuff, but on several pages. I haven't used the new site enough to completely appreciate the usefulness of those three tabs, though each apparently provides a different means of data aggregation. I am puzzled by a few things. For example, the 1942/1-D and 1942-D/D dime varieties don't show up in the Date, MM, and Major Variety tab list, but are accessible under the Related Coins and Varieties link of both tabs that show date and mintmark. Perhaps more experience will bring greater clarity. One information set that I have not yet found, available on the 'old' site, is a composite list of mintage information. Mintage data is there, but to find the mintage numbers from all mints for one year requires back-and-forth clicking. If your interest is a year-by-year comparison of mintage data, the old site displays that more directly. My biggest surprise, actually a disappointment, was that even though I was/ am already a paid user of the PCGS Population Report, the new CoinFacts site would not accept that login information to allow access. So I have now paid twice to access certain PCGS data, and will have overlapping subscriptions for awhile. Whether this is a user error, early adopter glitch, "not a bug but a feature", or whatever, I cannot tell; but I'm effectively being double-billed for the same services. Jeff Zarit�s comment that few of us remain who were around, or who can even remember, when Henry and Bill Christensen were active in numismatics, prompts me, as one of that diminishing few who are still, as far I can tell, alive and kicking, to contribute a few words. I first visited Henry when he had his offices at 545 Fifth Avenue, Hans Schulman�s long time location, but my more vivid memories are of his office in Hoboken at 95 River Street in the Hudson County National Bank building. He ran a lengthy series of mostly mail bid sales from his offices there for many years. On a couple of occasions I went to River Street to examine auction lots prior to a sale and Henry (who eventually became one of my sponsors for membership in the IAPN) would on occasion invite me for lunch at the then famous Hoboken Clam House, which was conveniently located diagonally across the street from his office, a lunch which was invariably accompanied by a martini or two, which I recall was Henry�s beverage of choice..
Henry�s sale of September 20, 1967 was a particularly memorable affair. It consisted entirely of medals, all of them, I believe, from the Medina collection. The main attraction was the huge number of Betts medals the sale included, and due to its importance Henry conducted it in his offices as a public sale. The sale attracted a number of numismatic luminaries to River Street. My memory, confirmed by notes in my sale catalogue, indicates that John Ford (the ubiquitous JJF) was there, along with Ted Craige, Billy Anton, Jim King, Charlie McSorley, and others - all of the principal Betts mavens of that era. Even though by 1967 I had already been a dealer for some ten years, I was still a Betts Babe-in-the-Woods, and although my catalogue indicates that I managed to buy some twenty lots (including a pair of trial pieces for Comitia American medals sold to the Smithsonian), I�ve often reflected since that if only I knew then what I learned subsequently. . .if only. . .if only. . .
Henry moved afterwards to an extensive suite of offices in Madison, New Jersey, near where he and Louise lived. When the New York International Numismatic Convention was founded a few years later, in 1972, Henry and Bill conducted the Convention�s principal auction sale for quite a few of the early years. The arrangements between our Convention and the Christensens, as I recall, were always on a handshake basis, never requiring a formal contract. After Henry was afflicted with prostate cancer, which ultimately proved fatal, Bill successfully carried on the convention auction on his own for a number of years. Today when numismatics in this country has become Big Business, when the major conventions offer a wall-to-wall panorama of coins encased in their plastic jockstrops, it is difficult not to look back with wistfulness to an era not so long ago when the Christensens were exemplars of those who practiced a more modest and low-key form of numismatics. In later years I occasionally saw Bill when he visited various conventions, invariably accompanied by his good drinking buddy, Ernie Keusch, but in time Bill faded from the scene, and I and others eventually lost contact with him. There is probably some specialty company which makes boxes to hold tabloid-size publications, but I haven't found it yet. Any suggestions? I get all of my coin board/album collecting and shipping supplies from BagsUnlimited.com , which also sells archival boxes. That would be a good website to start a search. On the question of rebinding, sometimes there is no choice. The movers ripped the covers off of my original Munro, Coins of Japan, when I came home from Heidelberg in 1979. I had Alan Grace repair it. He did so by making a new spine, using the original boards, with the fabric from the original spine glued over his replacement spine. You have to look closely to detect the fix. In another case, I bought an eight volume set of books in Tokyo that had been published 1925-26. The original bindings were 1/4 leather, with the leather decorated with symbols from Japanese ancient coins. One or two volumes were missing their spines completely, and a third was badly damaged. The cardboard slipcases were badly tattered, and some were missing. Grace again did the work, rebuilding the bindings for three books and manufacturing new slip cases for all eight. This time the work is a bit more obvious, because the replacement leather does not have the original decorations, but the whole set is a lot more attractive than it they had been left alone. But there is another numismatic angle to The Big Nickel story. To raise money back in 1963-64, when Szilva was building the statue, he created and sold medals to underwrite the cost. 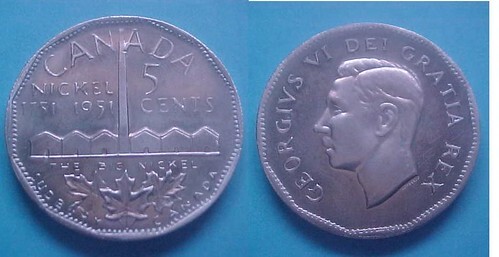 If memory serves me right, it was that same 1951 nickel in a size, of course, larger than the coin. And I'll wager an E-Sylum reader will respond, "Hey, I have one of those!" Prove it. Send Wayne an image. Round, nickel, 38 mm. Lightly circulated. Issued to honor "The Big Nickel" statue in the Canadian Centennial Numismatic Park in Sudbury, Ontario, Canada. One of a series of medals issued honoring the various numismatic statues in the Park. I'm still researching the numismatic output of the Guttag Bros. 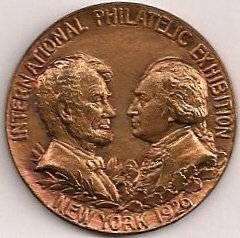 I would like to confirm the existence of the Guttag Brothers' Lincoln-Washington - International Philatelic Exposition New York, 1926 token in ALUMINUM (King 1065). Might any member have this token? Can the catalogue of a highly important numismatic collection, the publication date and other details of which are known from other sources, disappear off the face of the earth? This seems to be the case with a catalogue of the great Tiolier collection. Pierre Joseph Tiolier was Engraver-General of France from 1803 to 1816, his son, Nicolas Pierre, succeeding him in this position until 1845. Occupying this privileged position at the Paris Mint for so many years they were in a unique position to put together a marvelous collection of essays and special strikings by themselves and preceding French engravers. Based on information appearing primarily in Conbrouse�s Maison de France (1845) and a few fleeting references elsewhere, this is exactly what they did. 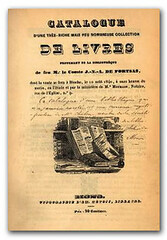 In 1840, according to Conbrouse, a small catalogue of the Tioliers� collection was printed by H. Fournier (a well-known Paris publisher), "petit in 8o de vingt-quatre pages". It is known from other references by Conbrouse to the catalogue that it contained at least 320 numbers. I think it highly unlikely, however, that the catalogue would have borne the Tioliers� name as owners of the collection, which was sold in 1841 to Rousseau, one of the two leading Paris dealers of the period. Unfortunately, despite having fairly exhaustively researched the French commercial numismatic literature of the 19th century (primarily in the library of the Paris Mint, and even more extensively in the library of the Cabinet des Medailles of the Biblioth�que Nationale), I have been unable to locate a single copy of this catalogue, nor any reference to it anywhere, other than Conbrouse�s mention of it. Apart from the small number of coins and essays that I know from other evidence were included in this catalogue, it must have listed a great many of the greatest rarities of the period that interests me (the French Revolution and Napoleon). It therefore goes without saying that I would give my right arm or any other appropriate part of my anatomy for even a glimpse of it. Any thoughts as to how or where to search further for this numismatic will-o�-the wisp would be most welcome. 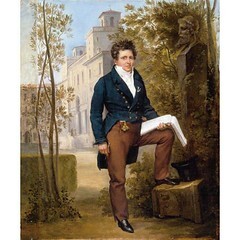 In the present painting, Nicolas-Pierre Tiolier (1781-1843) is captured with pen and pad in hand in the gardens at the Villa Medici. Tolier was, in fact, another pensionnaire at the Villa Medici from 1806 to 1811. He had the distinction of being the only person to have ever received an award for engraving on hard stone. After his sojourn in Rome, he returned to Paris where he was named V�rificateur des monnaies de la garantie. 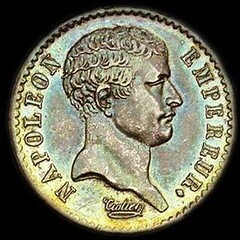 He also exhibited medals in the Salon from 1812-1831. I turned over the final report today (August 9, 2009) to the daughters of medallist Marcel Jovine. The results surprised us all. There were far more coins and medals he created than any of us had expected. It began back in 2002 when Marcel Jovine, a jovial and highly talented medallic artist -- and very much alive at the time -- talked about having me prepare a catalog of all his coins and medals. He had started a first effort of a dozen or so titles he wrote on a sheet of paper. We intended to meet. But appointments got postponed that year by a multi-month trip he took back to his native Italy. His two daughters, Andrea Jovine Coppersmith and Marcia Jovine, knew of their father's wish to have a book about his work and his accomplishments here in America. After all, he arrived here first as a Prisoner of War, repatriated and then returned to find in time, a wife, a profession, success, and ultimately great fame as the inventor of two toys -- Visible Man and the Visible Woman -- which brought him great wealth. The American dream come true! Creating coins and medals came late in life for Marcel. But because of that our paths crossed, as the bulk of his medallic creations were produced by Medallic Art Company. Here I had to help promote the sale of medals of his design. He was most noted for one of his medal series, the annual Medallic Art Calendar Medals, some 14 medals (1976-1990). These were of immense creative design, of American bicentennial events, the circus, the automobile, the history of flight, of Old Glory, of the Statue of Liberty, of sailing ships, tall and true. His Apollo Soyuz was in English on one side and Russian on the other. He even added his monogram in Russian letters on that medal. His American Numismatic Society's 125th Anniversary Medal is considered the most attractive medal in modern America. His medal on Creation for the Society of Medalists is a close second. At his Symposium I stated Italian artists are the top designers of medallic art in the world. "There must be something in the drinking water in Italy," I stated. That brought applause from a highly concentrated audience of Italian heritage. 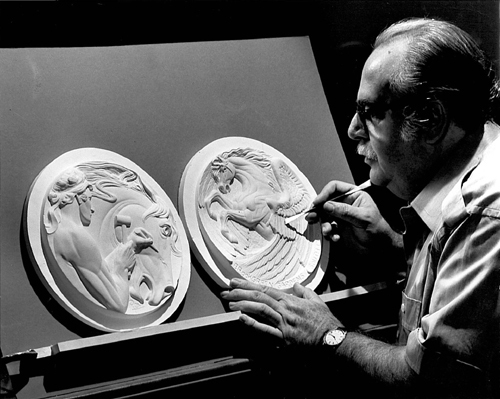 Marcel also created models for seven coins struck by the U.S. Mint. For his first -- the 1987 U.S. Constitution commemorative $5 gold -- he did both sides. It went down hill from there, where the U.S. Treasury selected only one of his designs to pair it with another artist's design. His seventh coin hit rock bottom. His reverse design was mixed with that of Alex Shagin's -- to neither artist's credit -- for the 2001 U.S. Capitol Visitors Center commemorative clad half dollar. He refused to do any more designs for the U.S. Mint thereafter. Last year Marcel's two daughters contacted me to reinstate the chores of cataloging their father's work. I gathered a team to photograph all his plaster models in his New Jersey home studio. (This was reported in E-Sylum vol 11. no 14, art 7, April 6, 2008.) Then the fun began of matching obverse with reverse, and identifying every medallic item. Marcel liked series, he participated in ten of these. I had to organize all these from photos, often with multiple images from plaster models in ongoing stages of creation. Research took me to many sources: manufacturers, sales literature, auction catalogs, and of course, my own files. I gathered data where I could find it and asked a lot of questions among a lot of people. However, even as recently as March this year, at that symposium in his honor, I was still saying Marcel's lifetime medallic production was less than a hundred. (Report on that Jovine Symposium: E-Sylum vol 12, no 11, art 5, March 15, 2009.) I had to drastically revise that figure. Bottom line as evidenced in the Final Report: 178 known coins and medals, plus 22 undated items. A short post on the Google News blog today revealed a big number: Google recently quadrupled the number of newspaper articles in its News Archive Search. The recent update saw Google add a bunch of new publications, including some from different parts of the world. And it even has a newspaper in the archives from 1753 now. The fact that it�s searchable is fairly insane. Google launched with "millions" of searchable articles, so now we have to assume it has millions times four (Google didn�t give an exact number). But this along with its book scanning efforts are getting impressive in their size and scope (but the book scanning is not without controversy). Of course, why Google primarily cares about archiving these old publications is not just for information, but also for the fact that it can sell contextual AdSense ads against them. In last week's issue I discussed the Dollar ReDe$ign project, where artists were asked to render prototypes for revised U.S. coin and currency designs. Predictably, images from the project have floated around the web with and without attribution, causing some people to wonder if these are official designs, which of course they are not. They said that these were the new American dollars — is this true? . They're not real in the primary sense that they aren't designs that were commissioned by the U.S. government or are being considered or planned as a replacement for our current forms of currency. They're purely the invention of graphic designer Michael Tyznik, who created them as his entry in the Dollar ReDe$ign Project, basing his vision of currency redesign on the premise that U.S. bills are "aesthetically lacking". Viewing the full range of Michael Tyznik's currency designs reveals that his set of Federal Reserve Notes omits the $1 bill but includes a $200 bill. This is because, as Mr. Tyznik notes in his explanation, he advocates replacing $1 bills with one- and two-dollar coins (as well as eliminating the penny entirely). The reverse sides of his designs also incorporate a feature not currently found on U.S. currency: the text of the ten Constitutional amendments that comprise the Bill of Rights. I really like Tyznik's currency designs. They're clean and balanced, classical in style yet with a modern flavor. I like the focus on architectural monuments - these are beautiful, timeless and symbolic of U.S. history and ideals. His notes remind me of the highly collected 1896 Educational Series notes. Tyznik put a lot of thought into these, including anticounterfeiting features and assistance for the blind. I think his concepts would be a fine starting point for any future redesign of actual U.S. currency. National Gold Exchange is not well known in the Tampa Bay area, but it's a big player in gold and rare coins and antique music boxes, which are large automatic music machines. The company keeps a low profile in Carrollwood, where it's tucked into a brick strip mall on North Dale Mabry Highway. Its only sign reads a vague "NGE." In testimony Monday, Sovereign Bank executive Elizabeth Sousa said bank examiners found a host of accounting errors and possible fraud at National Gold Exchange, which led them to declare the company in default of its loans last month. The bank is worried about the $35 million in loans it has extended to National Gold Exchange, which are secured by the rare coins and music boxes. 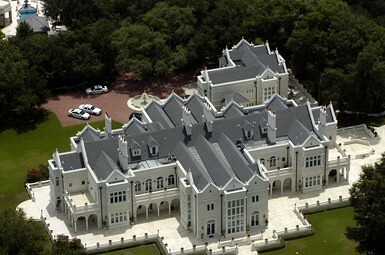 Among other things, the bank alleges the company may have sold up to $15 million in coins � which were collateral for its loans � to help pay for Mark Yaffe's $25 million home in Tampa's Avila community. McIntyre said Mark Yaffe has offered to use his equity in the home as collateral for the Sovereign Bank loans. This week's Featured Web site is Robert Fowler's ExpoMedals.com, a guide to award medals from U.S. expositions. America had some wonderful expositions and world fairs in the late Nineteenth and early Twentieth Centuries. Award medals, Official medals, souvenir medals, award medals, badges, pins, tokens, prize medals were issued at the US expositions and are great collectables. This site shall be to catalog most of the medallions from these events focusing on the beautifully designed award medals but inclusive of official medals, souvenir medals and tokens. These medals are historical, beautiful and interesting. If you have a photo of a medal from one of the US expositions, especially an award medal, email to us to use on this site.